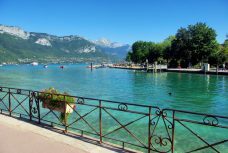 Ideally situated between a gorgeous lake and the mountains of the Alps, Annecy is an unforgettable town to those who have discovered it. Nicknamed “the Venice of the Alps”, the old town is criss-crossed by enchanting canals lined with colourful houses in Piedmontese style, guarded by the odd-shaped Palais de l’Île. 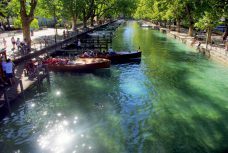 Annecy Old Town is also renown for its arcaded streets which shelter boutique stores, its castle overlooking the town and the Pont des Amours, the last sight before reaching the stunning pure waters of the lake. Old Annecy straddles the Thiou River for over 550 metres. 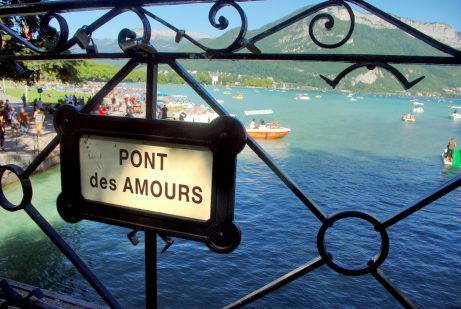 This waterway and its adjacent canals are fed by Lake Annecy before joining the Fier River, a tributary of the Rhône. The Thiou, with a length of only 5 km, is one of France’s shortest rivers. In the past, the waterway provided energy for the manufacturing industries which sprang up along its banks in the 19th century. 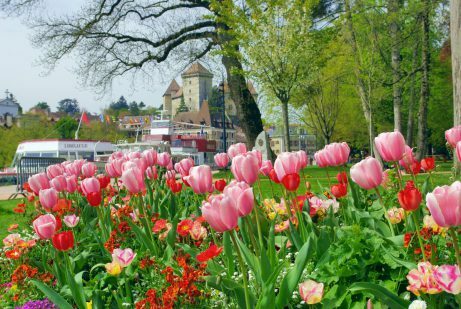 Today, the colourful houses clustered around the flower-lined canals contribute to the extraordinary setting of the old town of Annecy, ideally set between the lake and the mountains. 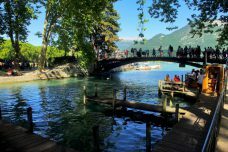 Coming from the lake, Pont de la Halle gives a picture-postcard view of the old town of Annecy and the banks of the Thiou River. From the lively restaurants on the left to the white sanctuary of St François de Sales on the right, the eye cannot miss the Palais de l’Île which appears straight ahead beyond the Perrière Bridge. For a closer look at Palais de l’Île and the two diverging branches of the Thiou River, the Perrière Bridge is the best lookout, arguably one of the most photographed sites in France. The Palais de l’Île resembles the prow of a stone ship seemingly advancing towards the river. The façades along the Thiou give the old town a definite Venetian atmosphere with their lemon, mustard, pink, salmon and pistachio-coloured roughcast façades. The Quai de l’Île as we walk through it today, was established in the middle of the 19th century whilst the other side of the river has remained unchanged. Crossing the Thiou between Quai de l’Île and Rue Sainte Claire, Pont Morens is Annecy’s first stone bridge. It was covered by houses until the 19th century. At both ends of the bridge, the street runs under houses. Today, Pont Morens offers pretty views over the houses along Quai de l’Île up to the next bridge, Pont de la République. The bridge marks the limit of “Little Venice” and provides a beautiful and very famous view over the banks of the Thiou looking towards the Palais de l’Île. The mechanical gates which regulated the water for a former large cotton factory downstream, are now adding to the charm of the banks. A clever system of water regulation was set up by engineer Sadi Carnot in 1874 to control the water level of Lake Annecy. Each Friday morning, a popular open-air market promotes local produce such as charcuterie, vegetables, fruit, flowers and cheese. Further downstream, on Quai des Cordeliers, is a covered wash house with cast iron pillars which was once used by Annecy’s washerwomen. The wooded island is accessible by Rue de la Gare. It was formerly the site of a large textile factory. The island has since been transformed into a public garden with a childrens’ playground. The walking track follows the right bank of the Thiou. Lined with trees, the path takes its name from Louis Lachenal, a mountaineer from Annecy who conquered Annapurna in 1950. The promenade extends to the commune of Cran-Gevrier. 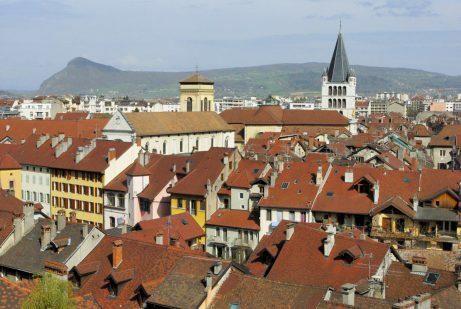 Between the banks of the Thiou River and the shopping precinct north of Rue Royale lies an historic district which includes many historic and religious buildings such as Annecy’s cathedral and the former bishop’s palace. The little square is bordered by the imposing façade of the church of Notre-Dame de Liesse and some fine Italianate houses. To the left of the church is the former town-hall which has been converted into a presbytery. The little house dates from the 18th century and features an elegant double staircase with fine wrought iron railings added in 1771. The coat of arms of Annecy (a trout) can be seen along the front of the central balcony. The Lion fountain in the centre of the square is made up of an obelisk and four lions and turtles. The lions symbolise power and the turtles longevity. The fountain was installed in 1859 to mark the completed works for the supply of drinking water to Annecy. North of Place Notre-Dame extends the shopping precinct of Annecy. Most of the streets are pedestrianised: Rue Royale, Rue du Pâquier and the long Rue Carnot which leads to the modern Courier shopping centre. At the crossroads of Rue Royale, Rue Notre-Dame, Rue du Pâquier and Rue Carnot is the old St John’s Well (Puits Saint-Jean). According to an old custom, the well was placed at the main entrance of the Convent of the Order of St John of Jerusalem. The religious order and its buildings disappeared during the French Revolution and the well was filled in for health reasons in 1805. It was opened again when the municipality worked on the pedestrianisation of the old town in 1976. The names of the guilds of Annecy who had it repaired in 1689 are still visible on the curb-stone. To the south of Place Notre-Dame, an arched passageway leads to Rue Filaterie and its picturesque arcades and boutique stores. A few narrow covered lanes link the cathedral’s rear to Rue du Collège Chappuisien, similar to the traboules which are typical of Lyon. The street parallel to Quai de l’Évêché is lined with several historic buildings: the façade of Cathedral St Pierre, the old bishop’s Palace, the Lambert House, the Choir School and the Mint. The long and austere façade of the old Bishop’s Palace (or Palais épiscopal) was built at a time when it was quite certain that the bishop would never sit again in the city Geneva which had embraced Protestantism during the Reformation. Works started in 1784 and ended in 1792 just a few weeks before the French Revolutionaries chased the bishop out of his residence. Today, the building houses the municipal police, the national school of music and the Académie Florimontane. Opposite the cathedral at number 13, the Choir School or ‘La Maîtrise’, welcomed French philosopher Jean-Jacques Rousseau during his stay in Annecy. There the French philosopher was initiated into the art of music. He was often seen playing the flute opposite the street in the organ loft of the cathedral. ‘Lambert House where St François de Sales lived from 1602 to 1610’. The mansion was built at the same time as the cathedral by Pierre de Lambert. In this house, the Bishop wrote his most famous treatise, ‘L’introduction à la Vie Dévote‘. 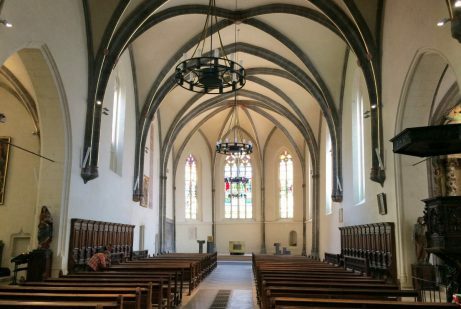 St François de Sales decided to make this house his residence when he became bishop of the Geneva Diocese in 1602. At number 12, the Mint (Hôtel de la Monnaie) and its courtyard can be seen behind strong iron railings. It features an elegant horse-shoe staircase. 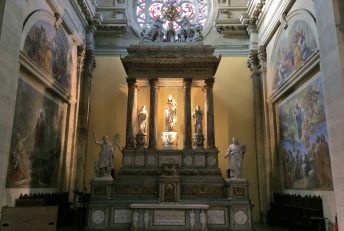 It once housed the bishop of the Geneva Diocese at different times until 1993, when he moved to larger premises next to the Basilica of the Visitation. 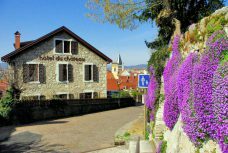 Between the banks of the Thiou River and the slopes of Annecy castle extends the district of Sainte-Claire with its old narrow streets. Opening the way to Chambéry through the St Claire Faubourg, the St. Claire Gate (Porte Sainte Claire) has kept the features of its medieval past: its machicolation and bell-turret. 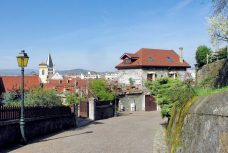 A fine view of the gate and the surrounding old houses can be admired from the bottom part of Chemin des Remparts. The Rue du Faubourg Sainte Claire is also closed by another but smaller gate: the Sepulchre Gate (Porte du Sépulcre). 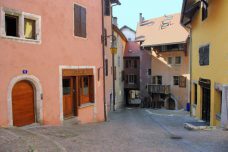 The St. Claire Gate leads into the Annecy Old Town where the visitor can discover a small square: Place Sainte-Claire. On the square the Gallo House, from the 18th century, has a beautiful and elaborate façade. It takes its name from the architect who built it for his residence. Rue Sainte-Claire is lined on both sides with arcades. These covered walkways, with a succession of arches supported by columns, provide shelter for pedestrians in wet and cold climates. At number 18, the Bagnorea House or Favre House was the residence of Antoine Favre, President of the Council for the Genevois region. The mansion, built in 1582, was given to his friend St François de Sales when he had to move to Chambéry to preside over the Sovereign Senate of Savoy. It was in this house in 1607 that Favre and St François founded the Académie Florimontane, a literary institution. Today, the association works on the history and archeology of Savoy. Rue Sainte-Claire is continued by Rue de l’Île and leads to the charming little square of Place des Efléchères. The Rue de l’Île is continue by the Rue Perrière which becomes narrower towards the Perrière Gate. This is one of the most picturesque sites in Annecy old town. 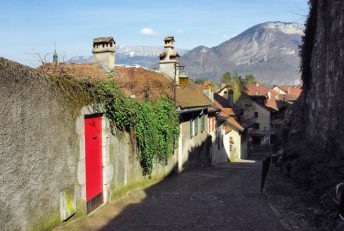 Even though there was a small gate in the thick wall which is part of the castle’s fortifications, the Perrière Gate was the main entrance to the Annecy Old Town during the Middle-Ages. It opened onto the road to Faverges, Albertville and Italy and was guarded by the castle’s Perrière Tower. 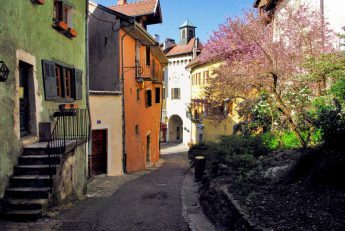 There are many steep narrow streets which lead to Annecy Castle. Most of them show the old town and its roofs from another yet interesting angle. In the 1530s, the events of the Reformation propelled Annecy to centre stage in the Catholic lands of the Duchy of Savoy. The bishop of Geneva was evicted from the Swiss city which had adhered to the ideals of Calvin. He took refuge in the nearby town of Annecy. As the new seat of the diocese of Geneva, Annecy became a strategic centre of the Counter Reformation, particularly with the leadership of St François de Sales. 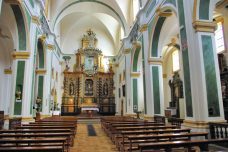 This resulted in the building or maintenance of many churches and religious orders. 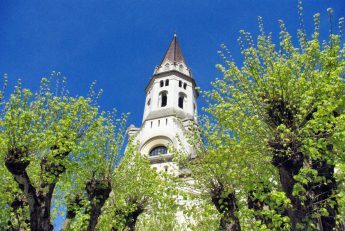 Today, Annecy’s historic churches are église Saint-François de Sales, église Saint-Maurice, église Notre-Dame de Liesse, cathédrale Saint-Pierre and basilique de la Visitation. 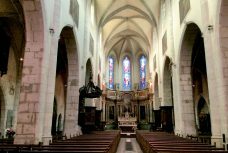 Find out more about Annecy’s historic churches. 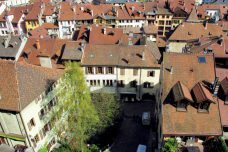 Annecy Old Town can boast of having two castles which are open to the public: the odd-shaped Palais de l’Île in the centre of “Venice of Savoy” and the towering castle atop the hill overlooking the old town. The picturesque little fortified house was built on a natural rocky island in the 12th century. Since the Middle Ages, it has served as a court house, a coin minting workshop and an old peoples’ home. Foremost it was a prison until 1870 and during World War II. The historical monument can be visited by walking through the Passage de l’Île bridge. Find out more about Palais de l’Île. The imposing castle is majestically placed atop a hill overlooking the Annecy Old Town and its lake. A former residence of the Lords of Geneva (a junior branch of the House of Savoy), its construction was spread out from the 12th to the 16th centuries. After being abandoned in the 17th century, it was then occupied by a garrison until 1947. Today, the castle is the property of the Town of Annecy and houses the museum of regional art and the Alpine Lakes Regional Observatory. 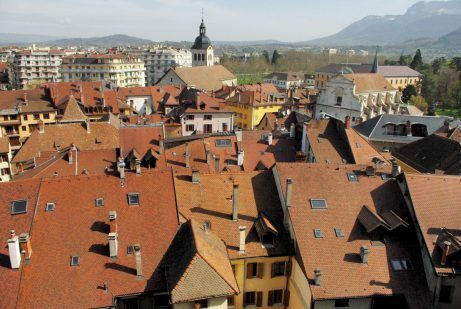 Find out more about Annecy Castle. 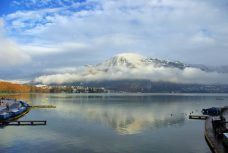 The stunning setting of the lake front is unforgettable: from the blue-green waters to the snow-capped mountain of La Tournette and the sharp rocky ridges of the Dents de Lanfon, the view from the lake front of Annecy deserves all the attention it arouses. 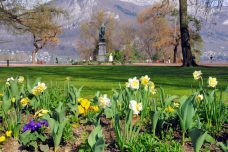 The northern tip of of Lake Annecy is bordered by the Jardins de l’Europe, Pâquier and Parc de l’Impérial which are situated to the east of the old town of Annecy. 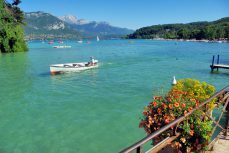 Find out more about Annecy’s lakeshore. 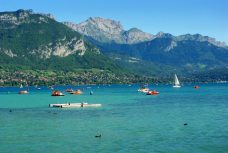 Check out the website of the Tourist Information Centre for more info about staying in Annecy. You can book your accommodation via their website: check it out here. I live in San Diego, California. About one year ago, a Frenchman named Yves Fournier, from the town of Annecy, opened a small bakery in my San Diego neighborhood (Scripps Ranch). His baked products are excellent. He is a fourth generation baker. His family has owned a bakery in Annecy for many years. His father, Pierre, still lives in Annecy and recently visited San Diego. Do you know the Fournier family in Annecy? I am asking because I believe I once read that you also lived in Annecy.